Peoples' National Congress (PNC) Party men, Philip Undialu and James Marape are leading the Hela Regional and Tari-Pori Open respectively. For the Hela Regional, Philip Undialu is leading by 16, 864 primary votes followed by Dr. Hewali with 7448 votes on second spot. For Tari-Pori Open, Mininster Marape is leading with a huge margin with 28,727 primary votes while on the spot, John Philip is trailing behind with 12 244 votes. 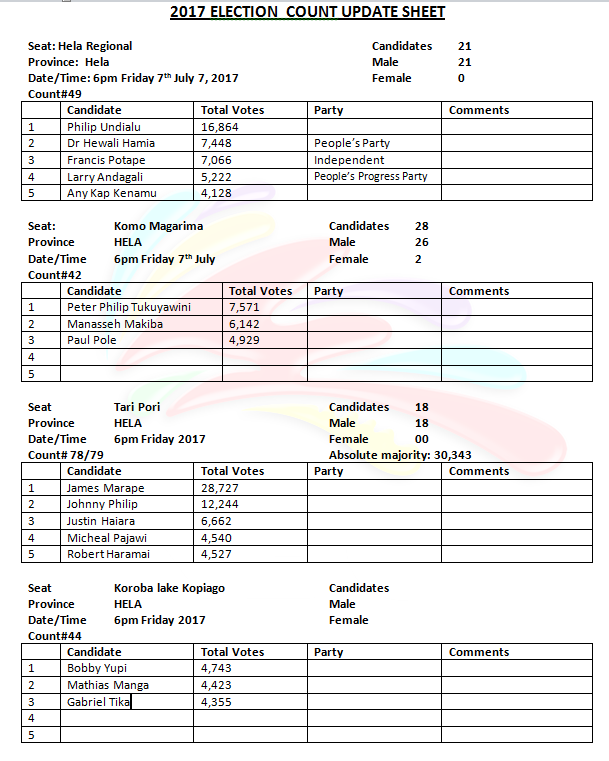 Former UPNG SRC president, Bobby Yuwi is leading the Koroba-Kopiago open seat with 4743 while following closely is Mathias Manga with 4423.